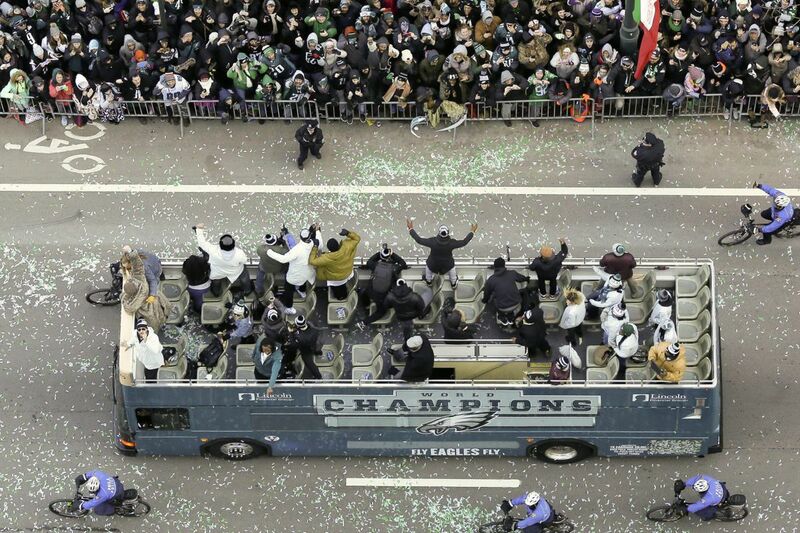 Who doesn’t love a good parade, in this case along the Parkway with the Eagles? When the Eagles won the Super Bowl three weekends ago, breaking their well-documented stretch of doing you-know-what for you-know-how-long, the organization didn't get just a trophy, a parade, and a leprechaun lineman with a colorful vocabulary. It also got the benefit of the doubt around here for an unspecified period of time. That period of time is somewhere between six months and forever, but it is probably advisable to lean toward the under. The six-months end of it is solid, though. The Eagles can sail into training camp without much outside criticism, regardless of what happens with the draft and the free-agent market. After that, when the regular season begins, things could get chippy again, but, hey, have you seen the trophy? The Phillies earned a similar grace period after beating Tampa Bay in the 2008 World Series, and it really continued until the 2011 postseason concluded with Ryan Howard lying in the dirt at home plate with a torn Achilles tendon. Even then, the team's sellout streak would stretch until the following August on the same momentum that allows a chicken to trot the yard for a while despite having lost possession of its clucker. If the Eagles remain as competitive as the Phillies for those three seasons after their championship, they could get the same pass, but football might be a little different here and impatience an ingrained default position. The Super Bowl glow is still strong at the moment, though. That was proved a few days ago, when it was reported that Doug Pederson had chosen wide receivers coach Mike Groh as his new offensive coordinator, with fellow candidate Duce Staley given the shiny bauble of a new title as a consolation prize. The Eagles have not yet confirmed those changes, perhaps to gauge reaction and adjust as necessary, but the reaction has been little more than a shrug. "Hey, did you see Kelce at spring training with the Phillies? Man, he's a riot!" Winning the Super Bowl has become a civic chamomile that left the fan base pleasantly relaxed. Moves that might have previously elicited a "what?" are now going to get a "whatever." Let's say, for the sake of argument, that the Super Bowl, the trophy, the parade, and the leprechaun didn't happen. Pick out any stumbling block of your choosing. Let's say the Falcons had first-and-goal at the 9-yard line with a minute to play in the divisional round and this time Matt Ryan and Julio Jones found a way into the end zone. As if it couldn't have happened? If the Eagles hadn't won it all, the idea that Staley, whose connection to the team stretches back 21 years, might be passed over for an assistant who got to town so recently would have been met with more than a shrug. But questioning Pederson's decisions isn't going to get you far right now, and it's easy to see why Groh is a comfortable replacement for Frank Reich, who left to become head coach at Indianapolis. Groh, like Pederson and Reich, is a former quarterback of the so-so variety, and he speaks the same language. You can imagine those Saturday night, game-plan fireside chats continuing as if nothing had changed. Staley, the longest-tenured coach on the staff, survived the crumbling of the Andy Reid and Chip Kelly empires, and was interviewed for the head-coaching job before Pederson was hired. In another atmosphere, there would be louder insinuations that the previous interview was as empty as the new title of assistant head coach, and the NFL's mandate to encourage head-coaching diversity should really be called the Mickey Rooney Rule, because it is a joke. There's little of that now, of course, because they won. In the same way, the town has gone goofy for Nick Foles, and would like to reward him with his druthers on a future career path because he deserves it. The NFL doesn't work that way. Foles did pull the most painful thorn from the paw of the lion, but unlike Androcles, who was granted unrestricted free agency, Foles' reward is limited by the terms of his contract. Should the Eagles decide what Foles really deserves is a baseball cap and a headset for another year, that's what he will get. And, since the Eagles won, that will eventually go over just fine, too. It turns out that winning the Super Bowl is a wonderful thing all around. Worries are wiped out. Criticisms are erased. A city's endless jitters are calmed. The future doesn't have to be assured because the recent past can never be changed. What a deal. If the Eagles had been aware of all these benefits – including that precious benefit of the doubt – they might have gone ahead and won it before. Now they know. Sounds like a repeat to me.